Following is an interview conducted by the APA TV team after our three hour media workshop held at the large American Psychiatric Association annual meeting on May 19, 2015 in Toronto Canada. It covers our scientific evidence that our individual awareness can expand into a vast body of knowledge, understanding, and wisdom beyond our life experience. Science has not yet accepted this possibility for expanded awareness. 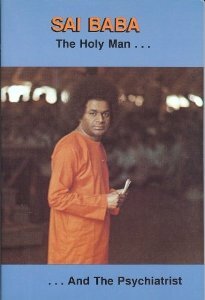 THE TASK — In 1983 Sai gave me a miracle to introduce science to the expanded consciousness of the spiritual dimension. This is the task we faced in presenting evidence that our individual limited consciousness can expand into a vast region of wisdom that lies beyond our life experience. OPENING REMARKS — at the scientific meeting about our case of Xenoglossy – the ability to speak and translate a language not known by natural means. EARLY LIFE TRAUMA — is it related to the appearance of Xenoglossy? ANALYSIS OF THE SANSKRIT — showing the complexity and coherence of the messages. SCIENTIFIC ANALYSIS — and understanding about consciousness and expanded states of consciousness — and how the case adds to our scientific knowledge about consciousness. SCIENTIFIC ANALYSIS — and science’s understanding about consciousness and expanded states of consciousness — and how the case adds to our scientific knowledge about consciousness. Following is the introduction to our three hour media workshop held at the large American Psychiatric Association annual meeting on May 19, 2015 in Toronto Canada. Our team reported on a case of Xenoglossy – my young Western patient who spoke, wrote, and translated 4 Sanskrit related languages about profound spiritual concepts from 4 different traditions that she had not previously known. This case provides scientific evidence that our individual awareness can expand into a vast body of knowledge, understanding, and wisdom that science has not yet accepted. This clip introduces the three presenters of the case and the patient. More will follow. Dana Gillespie, an acclaimed blues singer from England, has sung in front of Sai Baba on many of his birthdays and has introduced many Westerners to Eastern spiritual songs. In October 2011 she, accompanied by 19 professional level musicians, and a large choir performed a concert in Irvine California USA, in tribute to Sathya Sai Baba–titled the LoveTheLove concert. Click here are for more of the songs from the concert. Dr. Hymon Johnson es el Director del IESS ( Instituto de Educación Sathya Sai ) en los EE.UU. Aquí hay secciones de una entrevista de 2 horas con él celebrada el 10 de febrero de 2014 en el que describe Educare y su importancia para una sociedad sana.